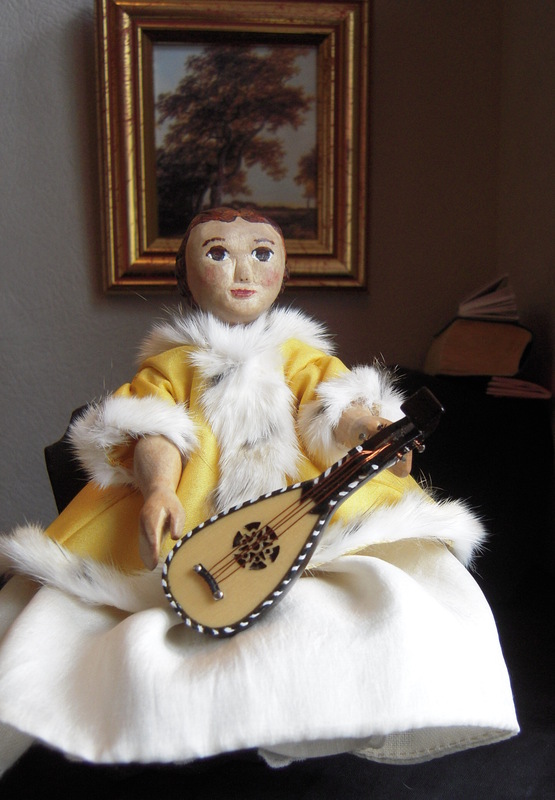 Constance recieved a tiny Lute from my son at Christmas in 2009. The month of December on my mother’s Vermeer wall calendar that year, showed the “Girl with a Guitar”. I took one look at the guitar in the picture and went off on a sewing jag that lasted for weeks. The result was a 1670’s outfit for Constance based on the painting, and a photo session during which Constance found it no hardship at all to sit “perfectly still without moving so much as an eyelash”… her spirit was willing to learn to play the instrument but alas, her pegs were not. Click this link for a look at an excellent website about the real Vermeer painting. If you click on the painting in that website, you get interesting information on different aspects of life and times in the late 1600’s. Sewing details of Constance’s outfit were taken recently. Click on any picture to launch the Gallery, and then use forward and backward arrows to navigate, and “ESC” to get back here. 1670’s Silk Bodice – Outside Front. 1670’s Silk Bodice – Outside Back with Lacing Loops. 1670’s Bodice inside – Silk Lining with Linen Busk Channel, Wooden Busk Partly withdrawn. 1670’s Silk Skirt Outside with Cartridge-Pleats stitched into Linen waistband. 1670’s Silk Skirt with Cartridge-pleated Waistband and Cheesecloth Lining. 1670’s Skirt Waistband – Cartridge Pleats. 1670’s Skirt Hem – Cheesecloth Lining. 1670’s Yellow Silk Jacket with Fur Trim – Outside Front. 1670’s Yellow Silk Jacket with Fur Trim and Pleated Back. 1670’s Silk Jacket, Inside – Light Yellow Silk Lining. 1670’s Jacket – Inside, Light Yellow Silk Lining. Little Lute, Masquerading as a Guitar. Thanks to the amazing ehpem for the detail photos. Holey Moley!! that is more than incredible!! I am enjoying the detail photos – great picture of Constance – She looks just like the original in her photo!! Thanks, Martha, I love sewing things by hand, and I have discovered that teeny clothes use up much less fabric and time to make, and also take much less space to store! Stunning and inspirational! Thank you so much for the detailed photos as well as the link to Vermeer…. and the lovely Constance in yet another historical journey! Thank YOU Becky for the impetus to do this! I love that interactive link to the Vermeer… I have to say that Constance has her eye on a Goya next! Millet – Oh I have my eyes on that goose-girl! Oh my! Even the background painting matches the original, as do the shadows! Great set-up! Ann S.
I had a lot of fun doing a Hitty-version of this painting, I might try another…. Thanks for the kind words 🙂 … it was fun taking the pictures. Just amazing. Constance looks so pretty in this outfit. Thanks for the link to Vermeer. Wish I could sew. It looks like so much fun. thanks for all the details. So so beautiful. I just love your Constance and all that she does. She is definitely a hitty with a mind of her own. Truly amazing….your sewing skills are a work of art! Thanks for sharing. Constance is one lucky little Quimper! Thanks, Denise…I love to sew…only problem is Constance’s closets are bulging. Probably I need more Hittys so they can wear some of the the clothes, so there is more room in the closets! Constance is fond of stringed instruments! I take my feathered, gathered hat off to you. That outfit is wonderful, so well researched, such tiny stitches. Hitty Lucy has been sitting motionless looking at the photos with her mouth open. Then the eyes flickered up to me and back to the clothes.